The development of an acne scar is due to the body's natural response of healing a pimple. The body must replace tissue that was damaged by the pimple, and this process can sometimes become imbalanced, leading to a scar. More specifically, replacing this tissue is a highly intricate process that involves balancing the activity of proteins that stimulate or inhibit collagen production. When the activity of these proteins becomes imbalanced, the body produces either too little or too much collagen, leaving behind either an indented or raised scar. Why does this occur more in some people than others? Research suggests that weaker but more chronic inflammation during the pimple healing process, as well as genetics, may make certain individuals more susceptible to acne scarring than others. 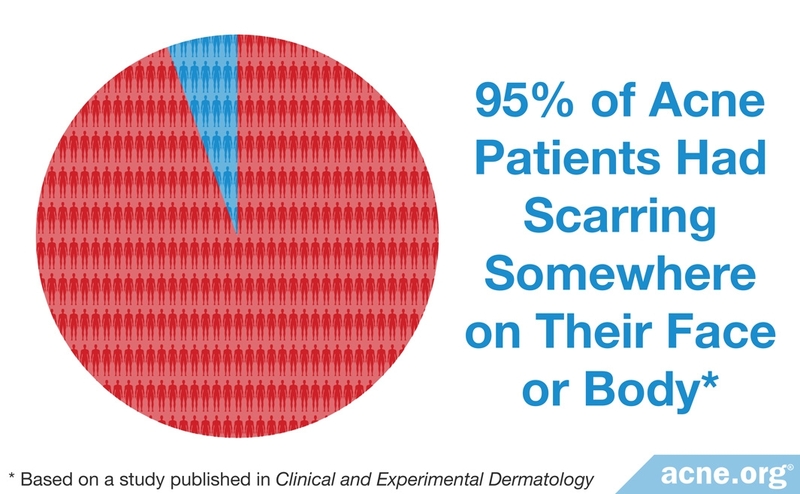 Scarring occurs on the body more frequently in males than in females, while scarring on the face is equally common in males and females. However, not everyone is equally prone to acne scarring. Individual differences in the immune system and genetics help explain why certain individuals are more susceptible to scarring than others. Atrophic (indented) scars are sunken due to a significant loss of an important skin protein called collagen. 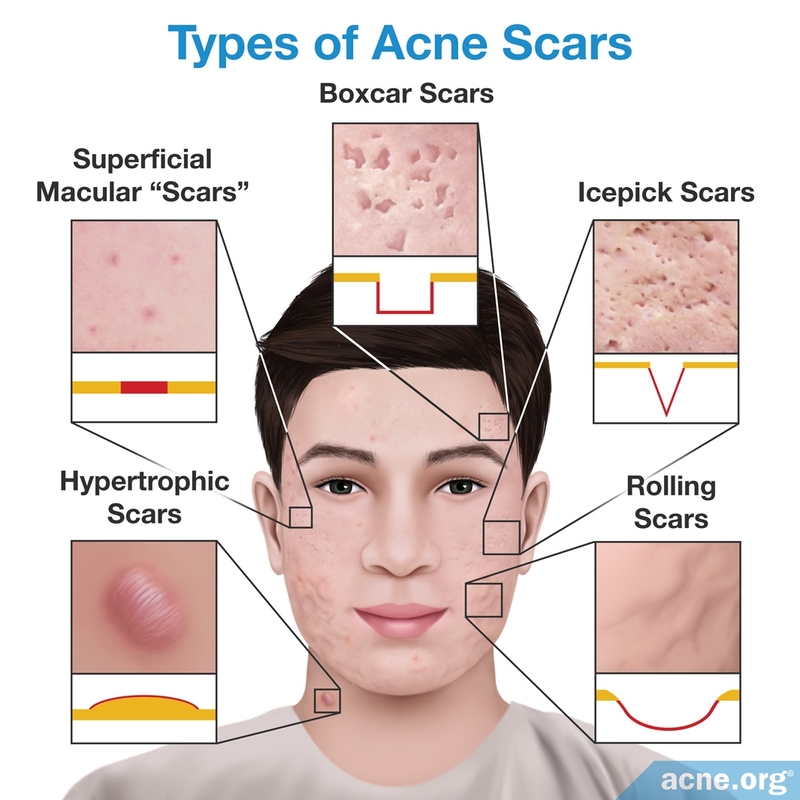 Often, these scars are given specific names, like "ice-pick" scars, "rolling" scars, or "boxcar" scars, based on the appearance and depth of the skin damage. These are much more common than hypertrophic scars. Hypertrophic (raised) scars are raised due to a significant gain of collagen. Once a pore becomes clogged, skin oil - which normally drains to the surface - is trapped inside and accumulates. Acne bacteria thrives on this skin oil and multiplies inside the skin. The pore expands, and the wall of the pore breaks within the skin. The immune system responds with inflammation, which consists of redness, swelling, and an infiltration of white blood cells. This forms a run-of-the-mill "pimple" or "zit. "2,3 If the clogged pore ruptures into deeper layers of the skin, it can develop into a larger, severe inflamed acne lesion like a nodule or cyst. Any type of inflamed acne lesion can scar, but nodules and cysts are more prone to scarring. The amount of collagen the body produces controls the formation of a scar. If the body produces too little collagen, atrophic (indented) scars will form. If the body produces too much collagen, hypertropic (raised) scars will form. The natural pimple healing process can vary greatly between individuals. 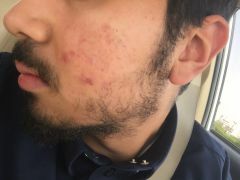 Researchers have attempted only a few studies that try to identify these differences and understand why certain people are more prone to develop acne scars than others. This research has focused on examining the (1) immune system and (2) genetics of people who are more prone to acne scarring. The immune system controls inflammation in our bodies. Research has found that the immune system can control the response to repairing the skin after a pimple. People who are not prone to acne scarring show a strong initial inflammatory response that is effective at quickly cleaning up acne debris. After cleaning up, this inflammatory response returns to normal levels. Research has attempted to identify genes associated with acne scars by investigating populations of people who are more prone to develop them. 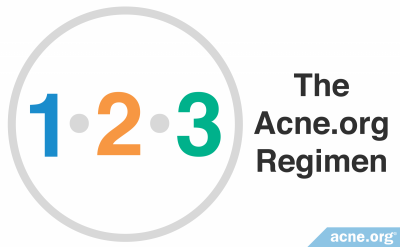 Overall, the research only weakly links these three genes with acne scarring. 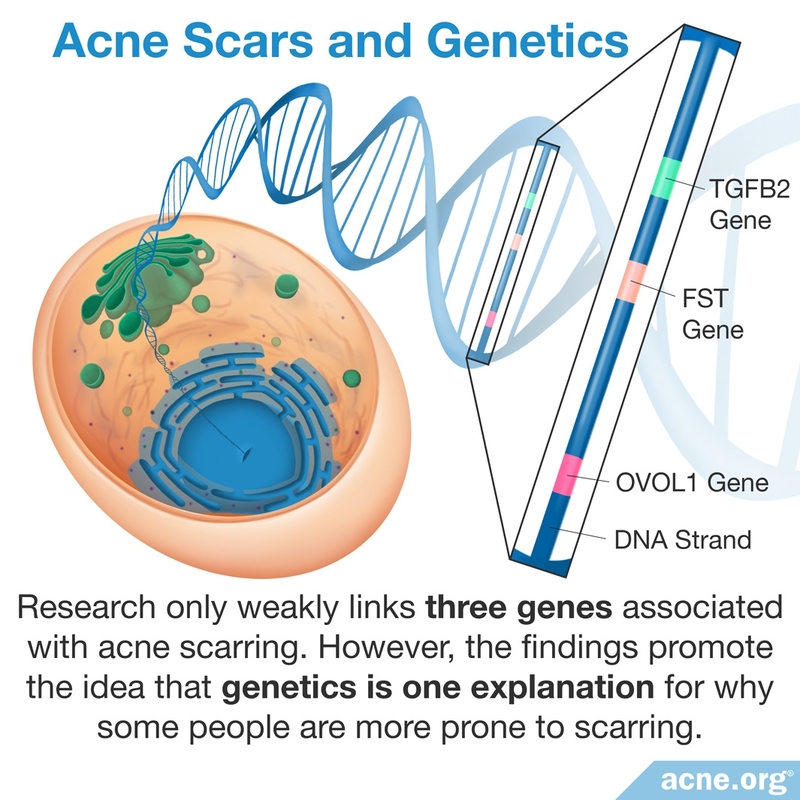 However, the findings promote the idea that genetics is one explanation for why some people are more prone to acne scarring than others. Scientists need to perform more research to confirm these findings, as well as to identify other potentially associated genes. Whether you are prone to scarring or not is most likely not something you can change. The best course of action when it comes to acne scarring is to prevent acne in the first place. An important thing to note here, however, is that picking at the skin can cause more scarring than a pimple itself. Therefore, it is absolutely imperative that you NEVER PICK at a healing acne lesion. If you want to pop a pimple, do that carefully and correctly, but never, ever pick at your skin. 1. Layton, A. M., Henderson, C. A. & Cunliffe, W. J. A clinical evaluation of acne scarring and its incidence. Clin Exp Dermatol 19, 303 - 308 (1994). 2. Goodman, G. J. Post-acne scarring: a short review of its pathophysiology. Australas J Dermatol 42, 84 - 90 (2001). 3. Goodman, G. J. Postacne scarring: a review of its pathophysiology and treatment. Dermatol Surg 26, 857 - 871 (2000). 4. Fabbrocini, G. et al. Acne scars: pathogenesis, classification and treatment. Dermatol Res Pract 2010, 1 - 13 (2010). 5. Holland, D. B. et al. 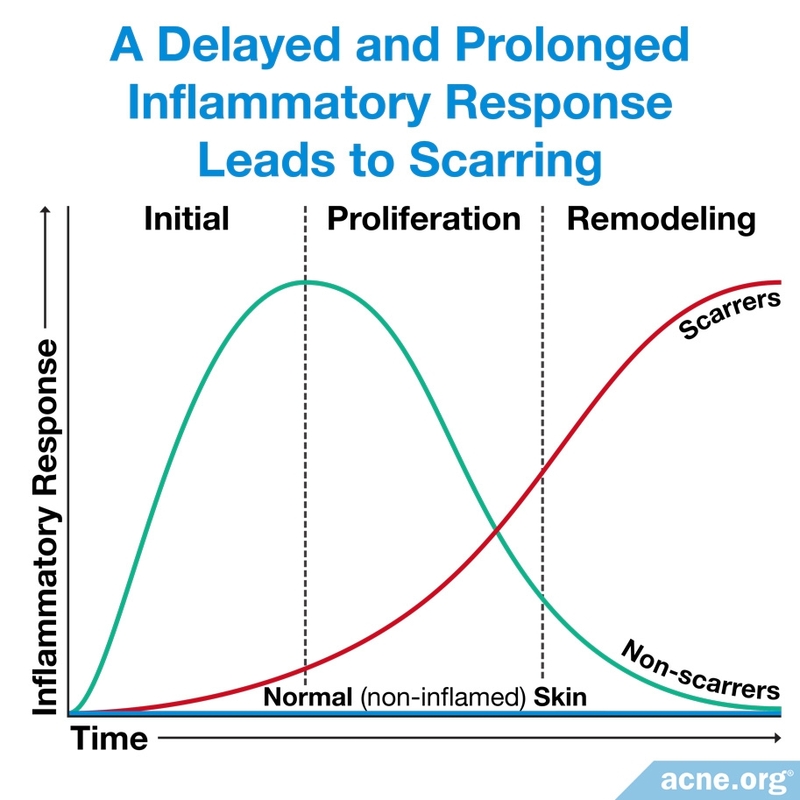 Inflammation in acne scarring: a comparison of the responses in lesions from patients prone and not prone to scar. Br J Dermatol 150, 72 - 81 (2004). 6. Navarini, A. A. et al. Genome-wide association study identifies three novel susceptibility loci for sever acne vulgaris. Nat Commun 5, 4020 (2014). 7. Zhang, M. et al. A genome-wide association study of severe teenage acne in European Americans. Hum Genet 133, 259 - 264 (2014). 8. He, L. et al. Two new susceptibility loci 1q24.2 and 11p11.2 confer risk to severe acne. Nat Commun 5, 2870 (2014).